In 1949, two bandits from Youngstown, Ohio, boarded a B&O passenger train from Washington, D.C., to Detroit. 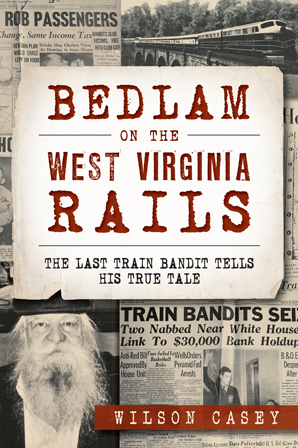 In the West Virginia mountains near Martinsburg, Luman "Lu" Ramsdell and his gang stopped the train to rob and terrorize nearly 150 people on board. They pistol-whipped several and shot at others before exiting the train to next rob a tavern and hijack getaway cars. National headlines likened the event to the exploits of Jesse James and the infamous days of the Wild West. Lu and the gang led authorities on a chase that ended with a harrowing shootout five blocks from the White House. Climb aboard with author Wilson Casey for a firsthand account from the head bandit himself in this true tale of America's last moving train robbery. Wilson Casey, a.k.a. the Trivia Guy, is one of the country's foremost trivia aficionados, with a syndicated newspaper column, an award-winning website (TriviaGuy.com) and a place in the Guinness Book of World Records for the longest-running radio trivia marathon broadcast. His various published works include books and daily box calendars and cover many subjects. When not out speaking, promoting, emceeing and entertaining, he lives in Spartanburg, South Carolina, as an avid tennis player.